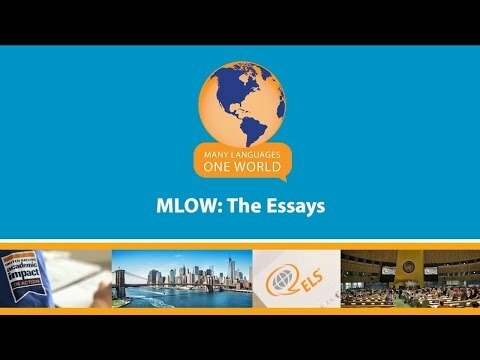 “MLOW: The Essays” showcases how the winners of the 2016 Many Languages, One World® competition wrote their essay competition submissions. In “MLOW: The Essays,” students reflect on their relationship with language, cultural awareness, global responsibility and their beliefs regarding each. In this video, winners discuss how their essays demonstrate their diverse perspectives and passions. Each winner, despite different backgrounds and experiences, agrees that language is a key to fostering global awareness and understanding. Students discuss being exposed to different cultures and the positive effect cultural awareness has had on their lives. “MLOW: The Essays” showcases how the students’ multilingual abilities have opened different doors and provided new opportunities, and shows how language affects their daily lives. The competition is sponsored by ELS Educational Services, Inc. in conjunction with the United Nations Academic Impact. Winners of the essay contest will meet at the Global Youth Forum in order to create action plans surrounding the United Nations 2030 Agenda for Sustainable Development. These action plans will be presented before the United Nations General Assembly at the event’s culmination on July 29, 2016.